Centerpieces for a fall wedding can feature more than flowers. While classic flower arrangements in bright fall colors are typical fall wedding decorations, there are other unique, seasonal choices for an autumn wedding centerpiece. If you do want floral centerpieces, add a touch of fall to them by adding wheat stalks or grains to the flowers and choosing a vase with a subtle fall motif. If something more unique is what you crave for a fall event, there are many beautiful options to try. Adding small gourds or pumpkins to a centerpiece gives it an instant touch of fall beauty, and including leaves in the arrangement is another way to add autumn color and theming in a simple but beautiful way. For a more rustic touch, consider unique vases such as baskets, tin pails, or miniature wagons. Colorful Indian corn can be a great fall wedding centerpiece. Tie corn in bundles with ribbons that coordinate with your wedding colors, or add corn to larger centerpieces. Bundles of corn can also be hung on walls easily for quick fall décor. Instead of floral centerpieces, consider fall leaf bouquets. The bright colors of fall leaves are perfect as accents to larger centerpieces or leaves can be used as solitary bouquets. To add additional plants to the bouquet, consider greenery, grains, or twigs. A basket of artisan bread in decorative loaves is a great centerpiece idea that doubles as part of the fall wedding menu. Use a basket cloth that coordinates with your wedding colors and be sure the bread is sliced and ready to be served. Simple stones and autumn candles is a perfect choice for beach wedding centerpieces during the fall, and adding a few small colored leaves or fall colored rose petals gives it a burst of color. Use burlap or rough linen table cloths for additional flair, and add a tan or orange seashell for a tropical touch. Leaf bouquets don't have to be dark. Bold leaf colors such as orange, yellow, and red pair well with contrasting vases in teal, green, and royal blue for a bright wedding palette. 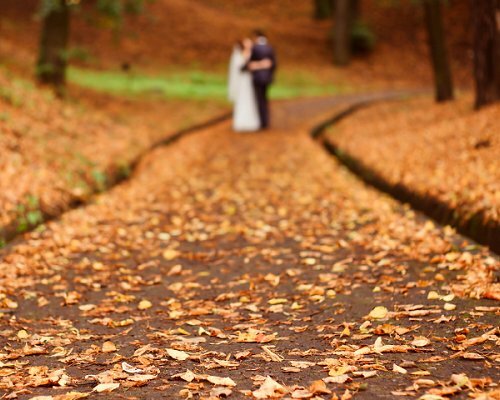 This gives fall brides great flexibility with their wedding colors while still incorporating a seasonal touch. Fall is a season of bounty, and a crystallized fruit display is a great alternative to fall floral centerpieces. Choose fall fruits such as pears, apples, and grapes, and pair them with a pillar candle and fall-themed linens for a unique centerpiece. It is easy to make your own fall wedding centerpieces simply by layering different fall accents together. Colorful leaves, small pumpkins, wheat stalks, and nuts can be easily worked into a centerpiece, and adding candy corn or other small accents gives it a whimsical touch. Other items to use include miniature hay bales, gourds, Indian corn, sunflowers, fall fruits, and pine cones. Fall candies can make a lovely fall centerpiece for a dessert bar or buffet table. Use tiered dishes for easy serving, and opt for seasonal treats such as caramels, candy apples, pumpkin muffins, or candied nuts. A grain bouquet is a unique and elegant choice for fall wedding décor. Wheat, oats, and barley are popular choices for a full bouquet or to add to floral centerpieces. Opt for an elegant crystal vase or wrap coordinating ribbon around a simple vase to match your wedding décor. A cornucopia is a fun seasonal option for wedding centerpieces. While fruit, vegetables, grains, and breads are the traditional fillings for cornucopia centerpieces, you can also add a more festive flair by using it to display fall wedding favors. For a more casual, rustic wedding, add whimsical figurines to your centerpieces for a bit of fun. Scarecrows are perfect for any fall wedding, while ghosts, black cats, and jack-o-lanterns are great for Halloween weddings and turkeys, pilgrims, or Native American figurines are suitable for a Thanksgiving celebration. A bowl of fruit can be a practical, simple, and beautiful option as a fall centerpiece. Seasonal fruits such as apples, pears, and grapes are the best choices for a fall wedding, and the bowl itself can be stunning crystal to add elegance. With a simpler bowl, consider adding a ribbon around the edge that coordinates with the wedding colors, and use fall leaves or boldly colored linens underneath the dish. If you like edible centerpieces but aren't fond of fruit, try a bowl of mixed nuts in a wrought iron or elegant crystal dish. Adding a note about how the bride and groom are nuts about each other is a fun way to coordinate this unusual centerpiece.